Saudi Crown Prince Mohammed bin Salman, right, meets with U.S. Secretary of State Mike Pompeo at the Royal Court, in Riyadh, Monday, January 14, 2019. Pompeo met with King Salman and the crown prince on the latest stop of his Middle East tour that has so far been dominated by questions and concerns about the withdrawal of U.S. troops from Syria. U.S. Secretary of State Mike Pompeo said he told the king and crown prince of Saudi Arabia on Monday that the Trump administration expects the kingdom to hold accountable "every single person" responsible for the slaying of journalist Jamal Khashoggi, who was killed inside one of the country's consulates after writing columns critical of the government. 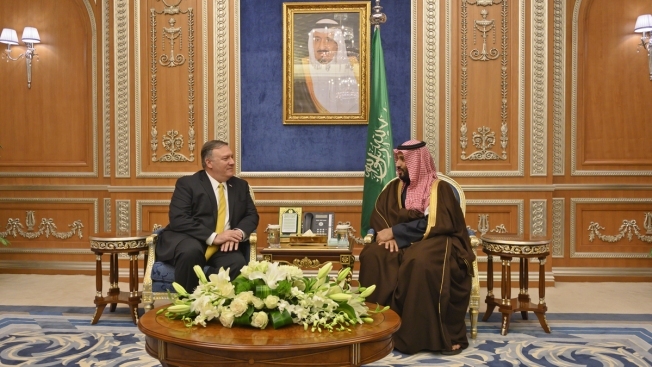 In talks with Saudi King Salman and Crown Prince Mohammed bin Salman, who has been accused by some of complicity in the murder, Pompeo said he had been clear about the administration's expectations. At the end of a trip to Riyadh that also focused on Mideast crises and countering threats from Iran, Pompeo said he had raised the Khashoggi case in his meetings with the king and crown prince along with other human rights issues, including the fate of women's rights activists detained in the kingdom. "We spoke about the accountability and the expectations that we have. The Saudis are friends and when friends have conversations you tell them what your expectations are," the secretary said. "Our expectations have been clear from early on: Every single person who has responsibility for the murder of Jamal Khashoggi needs to be held accountable." Pompeo traveled to Saudi Arabia as part of a broader Middle East tour that has already taken him to Jordan, Iraq, Egypt, Bahrain and the United Arab Emirates. He was to depart from the kingdom for Oman shortly after his meetings in Riyadh but canceled plans to wrap up the trip in Kuwait on Tuesday, due to a death in his family. Trump tweeted late Sunday that the U.S. will "attack again from existing nearby base if it (IS) reforms. Will devastate Turkey economically if they hit Kurds." Trump's decision to leave Syria, which he initially said would be rapid but later slowed down, shocked U.S. allies and angered the Syrian Kurds. Trump and Turkish President Recep Tayyip Erdogan later said later Monday that they spoke by phone to discuss cooperation on the withdrawal of the approximately 2,000 U.S. troops from Syria.